H-Vogue | The World's Favorite Yoga. Backbends are a tricky part of a regular yoga practice. They help to open up the chest and heart and encourage excellent spinal health. A healthy backbend practice can counteract much of the slouching and rounded postures that yogis tend to fall into throughout the rest of their day. It can be a very exciting and invigorating part of a regular practice. On the other hand, backbends can also cause a lot of trepidation for yogis concerned with significant wardrobe malfunctions. Even simple backbends, such as the wild thing, can leave stomachs and other sensitive areas exposed to the wandering eyes of classmates and instructors. As you move into more intense backbends, the wardrobe malfunctions can get significantly worse as shirts come up and yoga pants ride lower than expected. Is there anything you do to keep your focus off of your clothing and on the proper alignment necessary for a backbend? First, you need to ensure that all of your clothing fits you properly. Clothes that are too small are going to move around in the only ways they are able as you stretch out into a backbend. Workout gear that is too loose or baggy will flop around as you lean back into a more dramatic backbend such as the wheel pose or the camel pose. Workout tops should fit you snugly, hugging your abdomen and chest firmly. They shouldn’t be tight enough to restrict your movements or your breathing, which are two very important elements in a healthy backbend practice. When you try on potential workout tops in the store, consider how far they ride up your stomach when you stretch your arms overhead. Do they gape open when you bend over? If so, it’s a sign that you may need a snugger fit. Tank tops are really ideal for an avid backbend practitioner because they allow the arms and shoulders to move freely without affecting the coverage of the torso. Women should be careful to wear sports bras with adequate support. If a backbend does cause a shirt to gape open unknowingly, this allows you to still feel comfortable in knowing that none of your classmates are bound to see things you would rather keep private. It is a great peace of mind so you can keep your focus on opening up your heart and chest. Many yogis like to wear high-waist yoga leggings if they plan to practice many backbends in a specific sequence. The higher waistline provides extra coverage for the abdomen when the back arches drastically, such as in the wheel pose. It also keeps the skin protected from the yoga mat in softer backbends like the bow pose. Lower-waisted pants can be worn to practice backbends, but you may consider pairing them with a much longer workout top. It isn’t uncommon to see extra skin from the stomach in a backbend, and this helps you to remain covered. Dressing for a solid backbend practice doesn’t have to be difficult but it does require some advance planning to keep you comfortable and covered during class. It’s not uncommon for yogis to find themselves restless at night, tossing and turning instead of dreaming peacefully. Sleep deprivation can affect almost every area of your daily life from mental clarity to your physical energy. Work and relationships all suffer when you aren’t feeling your very best, which is often the case when you aren’t sleeping through the night. A regular yoga practice has been shown to help increase the amount of quality sleep you receive each night. You don’t need to devote an entire hour to your yoga practice. All you need to do is put on a comfortable pair of yoga pants. You can incorporate these simple yoga elements into your bedtime routine to help you fall asleep and stay asleep. Breathing is an integral part of every yoga practice. 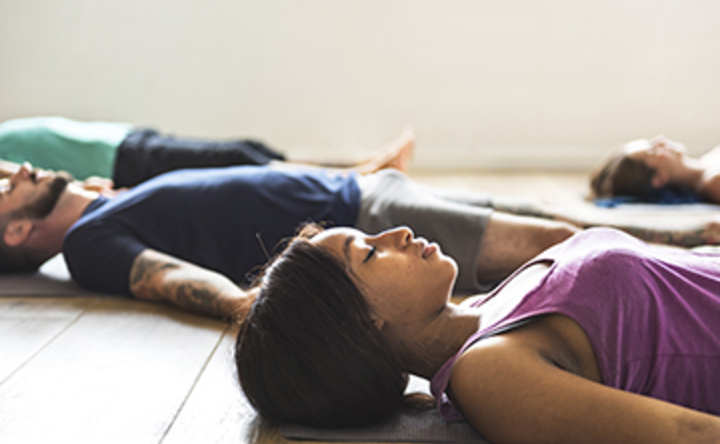 Whether you practice the more rigorous disciplines or the gentle flow of yoga nidra, connecting with the breath is an essential element to your yoga practice. Similarly, focusing on the breath can be an important part of helping you to fall asleep faster. Focus on taking long, slow, and deep breaths in through the nose and exhaling loudly through the mouth. A gentle inhale helps to soothe the body while the more forceful exhale rids the body of tension. Try to keep your mind focused solely on the inhale and exhale during this exercise, letting all other thoughts go. Do you often feel jittery at bedtime or anxious at the thought of tomorrow’s to-do list? Taking a few moments to relieve the nervous system and change your perspective can often do wonders for your anxiety. When worries subside, your brain is able to take a moment to turn off for a few hours of rest. The standing forward fold can help you to lower your anxiety quickly. Hinge forward from the hips, clasping the elbows. Nod your head a few times, and then practice shaking it side to side to release tension. You may need to don a comfortable pair of yoga pants to move into this pose more freely. You want to wear comfortable workout clothing that doesn’t restrict the breath or your ability to stretch. Take a few minutes before bed to do a type of meditation known as a body scan. Lay flat on your back in bed, with the feet open and the palms facing up by the sides like you would in savasana. Explore and bring attention to each area of the body, noting and releasing any tension you feel in each section. Move from the toes all the way to the crown of the head. This progressive scan helps you to physically relax the body bit by bit, preparing you to finally release the mind and drift off to sleep. If you have trouble falling asleep at night, try adding these three yoga elements into your bedtime routine. You may just find yourself becoming a more active participant in your daily life when you wake up feeling refreshed and well rested. Vinyasa Yoga is a type of yoga that developed as an offshoot of Ashtanga yoga. It may have developed to accommodate people who felt that Ashtanga yoga was too rigid and strict. Ashtanga yoga is a type of yoga that was developed by a 20th century guru by the name of Sri K. Pattabhi Jois. In comparison to most other types of yoga, Ashtanga is powerful, dynamic, and strict in terms of the way the poses are done. Unlike Vinyasa, one must master a given stage or pose before moving on to the next level. With Vinyasa yoga, students have the freedom to progress based on their own capacity. Although Vinyasa contains almost all the poses found in Ashtanga, students do not have to follow the same sequence when performing them. One is free to move to another more accommodative pose when he or she feels that they are unable to master the previous one. As new styles of yoga keep developing, there are numerous offshoots that have developed under Vinyasa. These include Flow Yoga, Power Yoga, Prana Yoga, Anusara, Hot Vinyasa, and Jivamukti. The poses in Vinyasa are unique in that they flow in a dynamic sequence. The performance of Vinyasa involved synchronizing continuously flowing postures with one’s breathe. By combining these flowing movements, one can improve health, strength, flexibility, stamina, and calm the mind. The combination of breathing and postures is an important part of Vinyasa Yoga. The fact that Vinyasa is not as strict as Ashtanga and some other forms of yoga, it offers something else instead. A chance to self-evaluate. While members still benefit from the exercise part of it, the real benefits are in engaging with oneself, understanding yourself and even knowing how to love yourself. Look great while getting your Vinyasa Flow on! Shop the above look here . Vinyasa movement helps engage various organs in the body thereby improving their overall state. For example, the poses help open up the muscles, practice the joints, improving bodily air circulation, and thereby decongesting the body organs. The form of meditation offered in Vinyasa Yoga is dynamic. This is because tutors encourage participants to engage their minds fully even as they make the flow movements. There is no completeness in Vinyasa without strong mental engagement. Breathing and Movement – Here you learn when, how, and when to incorporate breathing into the yoga movements. Understanding Sun Salutations – Each Vinyasa class incorporates these salutations making them a basic component. How to Vary and Adapt to the various movements. – Since Vinyasa is not a rigid yoga class, it is important to know when to transition to the next step. Finally, understand alignments and transitions. These are the basics of Vinyasa and they are easy to learn and understand. There are a number of body locks, which are referred to as Bandhas and yoga postures, known as asanas. These work together with purification exercises known as shatkarma to keep the body healthy and strong. For most people, this is the level of yoga that they know and assume it all to be, but in reality it is just the introductory step. This is the level of yoga that mainly focuses on the postures and has a wide array of benefits like lowering blood pressure, lowering sugar levels, regulating the production of the stress hormone cortisol and much more. Each pose comes with a set of benefits which are healthy and have therapeutic effects. In essence, as far as the body goes, yoga is a preventive medicine, with a wide array of benefits. The breathing exercises in yoga are known as pranayama, and this has a great connection with the function of the mind. As such, when you start practicing the breathing exercises in yoga, your mental state will improve. This type of yoga allows you to enjoy calmed breathing and also helps to calm the mind. There are many different types of pranayama techniques, and each will carry its own set of benefits. Over and above the breathing techniques, yoga is essential for your emotional wellbeing, meditation as well as physical health. Ideally, this will involve a seated posture and taking deep breaths through the nose. Mantra: In this case, you will keep repeating a certain sacred word throughout the session, while focusing on a feeling that can resonate with that word. This is also known as Japa. Chakra: This type of meditation requires one to keep their mind focused on one of the 7 main energies that are in the body. During this time, you will be required to visualize a number of mantras. Trataka: With this type of meditation, you will gaze on an object such as a candle with your eyes wide open. Then you should close your eyes and still be able to have that image in their mind. With all these options of yoga, you can adopt yoga as a lifestyle. This will allow you to integrate all the core values into your life without much difficulty. With yoga, you can give your body the flexibility it requires, and as such, you will enjoy holistic health. Your mind, breath, and body are the core pillars of your life. With the core aspects provided above, you will be able to lead a yoga lifestyle and reap its multitude of benefits.